In 2003 the Top Secret Drum Corps Basel performed at the Edinburgh Military Tattoo for the first time. Brigadier Melville Jameson was the Chief Executive Producer at the time and contact has been maintained between Mr Erik Julliard, head of the Corps and producer of the Basel Tattoo. 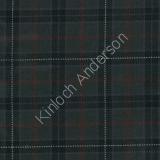 The sett of the Basel Tattoo tartan was based on the Ancient Stewart tartan, this being the personal tartan used by Brigadier Jameson. The design was created by Thomas Stauffer one of the directors of the Basel Tattoo. Colours: a dark overall appearance was requested, incorporating black (one of the colours in the coat of arms of the canton Basel-Stadt) together with dark green; white (also a colour of Basel-Stadt) and red are the colours of Switzerland; the blue stands for the close connections with Scotland and the Edinburgh Military Tattoo.